Implants are very versatile and can be used to replace a single tooth or multiple teeth as well as help hold a denture in place or completely support it. Implants require surgery to place in the bone and usually need a period of time for the surrounding bone to heal before a prosthesis can be affixed to it. Dental implants are an excellent treatment modality that offers an aesthetic and long-lasting restoration. 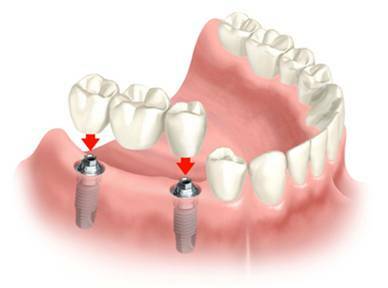 We develop the treatment plan and will coordinate your care with oral surgeons who are experts in placing implants. Because treatment involving dental implants can often be complex, there may a time you will be wearing temporary prostheses until the implants have fully integrated and are ready for restoring. 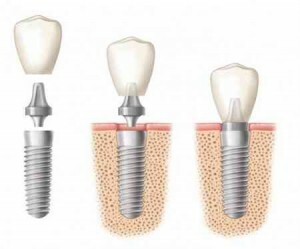 Q: What are dental implants and can I get them? A: A dental implant is a surgical device placed within the bone of the jaw and is used to support a dental restoration to replace missing teeth. Dental implants have been actively used in dentistry for over 30 years and have revolutionized modern dentistry. Before implants, our treatment options for missing teeth were limited to using adjacent natural teeth to support a bridge or a removable partial denture. 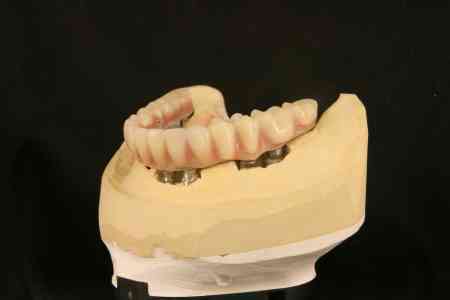 If the patient lacked any teeth, complete dentures were used. Implants have allowed us to perform simple procedures like replacing one tooth, or complex procedures such as supporting a complete dentures to replace all missing teeth. Not everyone is a candidate for dental implants. Compared to traditional crown and bridge, dental implants are a little more complicated and have a surgical component that can result in taking longer to achieve the desired outcome, as well as costing more. Your dentist can explain the requirements needed for placing dental implants and what kind of restoration may be recommended to best suit your needs. Q: I was told I need bone grafts if I want implants. What is that and why do I need it? A: If you have been told bone grafting is needed, then it is due to the fact that the location where your dentist needs to place an implant lacks the sufficient amount of bone. An implant is dependent upon the surrounding bone in which it is placed for its support and positioning. If there is insufficient quantity of bone, then more may be gained by way of bone grafting. Grafting is a surgical procedure in which bone material is placed at the site where dental implants are desired. The material is placed in intimate contact with your natural bone under the gum tissue and a healing period of around 4-6 months may be needed for the graft to be ready for implantation.